I've been at the new position for about a month now. I'm one of the Admins for a global Linux based network. There's no shortage of oddities to deal with around the globe. I'm enjoying it and it's really nice to be with like minded folks (nerds!). I've had to adjust to a larger environment moving from a 2 man team to a 6-7 man team in a rather large company. It's going to be fun. I've started some classes as well. A second Network Security course which is very Windows centric. I suppose when you're trying to patch holes you go for the most breakable OS. I plan to sit for the Security+ exam after this class and will hopefully end up with a voucher from the course. Of course this means I'll be giving some more money to Darril Gibson for his audio material and ebook covering the SY-301. This will finish up my security courses for a while until I start work on the CCNA:Security sometime in the next year or two. My second class is the VMware vSphere: Install, Configure, and Manage V5. It's being offered at my local community college for a fraction of the normal 1-3K cost. It does however come with the caveat of being 16 weeks long. You do most of the labbing in a "Pod" which is a virtual setup of a small vSphere installation. It's a not huge difference from deploying Openstack locally and having a private cloud at your disposal. As I understand it though, the VCP5 exam (VMware Certified Professional) requires a good amount of studying in order to pass the exam. That said, it's not just the VCP anymore. 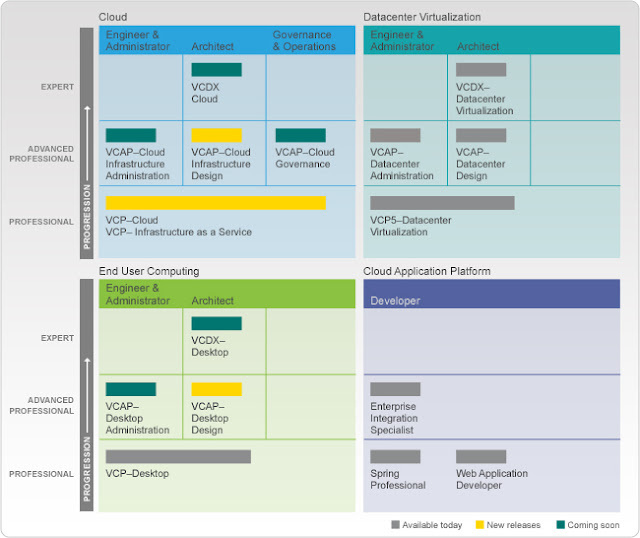 Thc VCP exam has been broken out into 4 different flavors (and I might be late to this game), VCP IaaS, VCP Cloud, and VCP desktop, and VCP datacenter virtualization. The world wide web is known pertaining to giving announcement along with activity. Nevertheless more recently, world-wide-web is known pertaining to featuring puzzle games titles that are easily accessible and provide activity along with pleasure. We would get various methods to make use of your pleasurable however your favorite moment cross can be playing flash games. This certification will certainly suit Easiest towards candidates which wish in order that About the integrity AND program code of your VMware Certified Professional certifications. Recently, Pearson VUE offers excess this exam AND therefore candidates be required to register with Pearson VUE center or within web site for registration. VMWare is one of the biggest companies in world who is providing best certifications if you can pass them. well i know it because one of my client who was taking Web Development Services Islamabad was doing this certification. VMWare is really a big name. I want to hack my neighbor's wifi and i searched for some tutorials and then i used VMWARE. 8 weeks 1 day pregnant ultrasound Well, i was searching for some pregnancy blogs to learn about 8 weeks 1 day pregnant ultrasound. I read your post.The information you provide in this article is really good. Your way of communication is nice.